The 47.2 metre motor yacht Triumphant Lady has changed central agencies and is now listed for sale by John Weller at Camper & Nicholsons. Built in GRP by Japan's Nishii Zosen-Sterling yard with delivery in 1985 Triumphant Lady received a major $12 million refit in 2009. She has an interior layout designed by Bannenberg & Rowell and Cindy Mason, which sleeps up to 10 guests in a master suite and four double cabins, all with television screens and en suite bathroom facilities. She also has quarters for a crew of nine. The main deck saloon dining room is enclosed with vertical oval windows, each covered with electronically operated shades, allowing for privacy. The beautiful custom oval mahogany and teak table seats 10 guests in chairs upholstered in raw silk. Forward is a large maple credenza with maple top for china and glass storage. The entire floor, including the port and starboard entrances, is in Giallo Veneziano granite, infusing the area with effortless elegance. 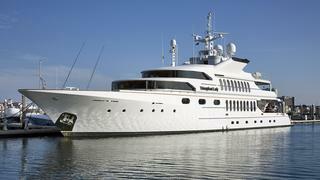 Up on the sky lounge of this yacht for sale, aft is the interior stairwell leading down to the main deck. Forward of the open stairwell is a large custom gold toned sofa and two lounge chairs covered in blue, white and gold stripes, with all the seating surrounding a large black granite coffee table. Forward of this seating area to starboard is the elevator and to port is a black granite bar with four high backed bar stools. The bar is equipped with a Sub Zero ice maker and Sub Zero fridge. The sundeck is spacious with teak decking and forward is an al fresco dining area with seating for eight guests and a round table. Aft is the gym with its fully functional sauna and private bathroom with shower. There is also a television and entertainment area. Further aft is the helicopter landing deck with landing lights and removable stanchions. Twin 1,300hp Caterpillar diesel engines give her a cruising speed of 13 knots and she is fitted with Naiad zero speed fin stabilisers. Lying in Florida, Triumphant Lady is asking $6.9 million.